But is that a totally bad thing? 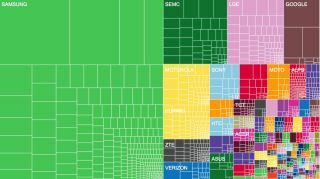 A new study published this week uses colorful charts to demonstrate the splintered nature of the Android ecosystem, both by device and by OS version. According to OpenSignal, of the last 682,000 Android devices to download the company's signal-finding app, there were 11,868 unique phone models. Compare that to the previous year, when there were just 3,997 unique models among 682,000 devices surveyed. Of the 682,000 counted this year, 47 percent were made by Samsung, and 37.9 percent used Jelly Bean, the most recent version of Android. In total, OpenSignal found that there are eight different versions of Android in use. Compare that to iOS, where 95 percent of devices are on the most recent version, iOS 6, 5 percent are still on iOS 5, and the older versions combined have less than 1 percent, OpenSignal claims. No doubt that will change when iOS 7 drops this fall, but isn't that always the way of things? In November 2012, 54 percent of Android users were stuck on Android 2.3: Gingerbread, a number that by now has dropped to 34.1 percent, according to OpenSignal. The study also showed that Android devices have many times more screen sizes and shapes than other mobile operating systems, in particular iOS. "What is clear from this report is that Android fragmentation, of all varieties, is increasing," the study read. "Too often this is treated as a problem with Android, rather than a strength, but we feel that this misses the bigger picture." According to the study, "developing apps that work across the whole range of Android devices can be extremely challenging and time-consuming." No surprise there. But is there a silver lining? "The availability of cheap Android phones (rarely running the most recent version) means that they have a much greater global reach than iOS, so app developers have a wider audience to build for," the study claimed. "It may be tricky to do, but the potential reward definitely makes it worthwhile. For consumers, extreme fragmentation means that they can get exactly the phone they want – big or small, cheap or expensive, with any number of different feature combinations." The fragmentation of Google's OS has been touched on many times before. Android Co-Creator Rich Miner said this month that Android fragmentation's no big deal. And early last year, analysts claimed that developers were losing interest in Android because of the difficulties of creating apps for such a fragmented OS - though to this day Android still leads the pack in terms of market share. Still, issues are certainly present, or talk of fragmentation wouldn't arise so much. At least Google probably isn't in denial anymore at this point. Can a week living with Android convince an iOS die-hard to make the switch?